Estes Park, a small mountain town at the mouth of the Rocky Mountain National Park, is a major tourist destination in the summer. 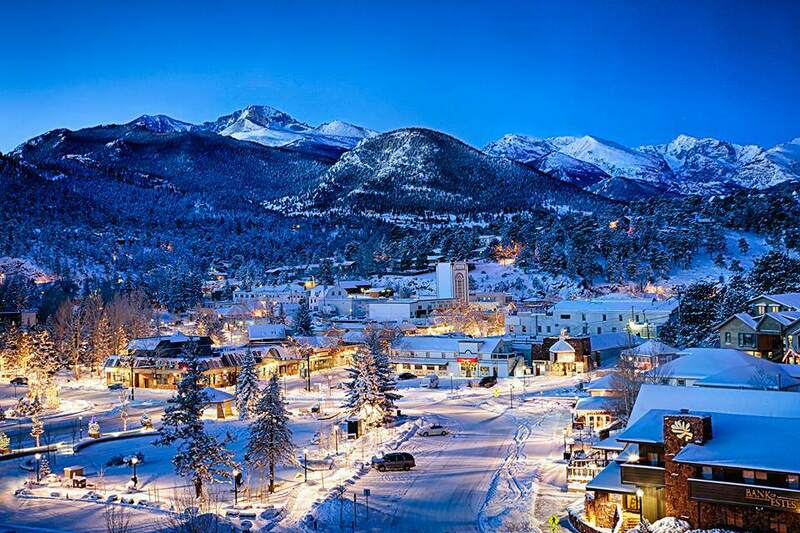 But what many visitors—and locals—don't realize is that Estes Park is one of Colorado's best winter destinations, too. Here are four new ways to experience Estes—in the winter and they include wine tasting and snowshoeing​ which is a wonderful combination. Estes Park may not have its own ski resort, but don't let that deter you from planning an active winter vacation there. You can still get outside in the snow. Snow accumulation in the Rocky Mountain National Park means skiing and snowshoeing, sledding and snow forts. On the Estes Park side, the national park's east side cross-country skiing is possible as is backcountry skiing near the former Hidden Valley Ski Area. Families and others who arrive after a big storm with sleds and tubes in hand for a day of snow play enjoy the lower reaches of the area. You can go snowshoeing or winter hiking. Rangers and volunteers lead a few treks, and snowshoeing equipment is available for rent in Estes Park. The Rocky Mountain Conservancy organizes outdoor, educational activities, including a Winter Ecology Snowshoe Trek through Rocky Mountain National Park or along the nearby trails. If you want to explore on your own, get a pass to the Rocky Mountain National Park and take your snowshoes up to Bear Lake, which can be 25 to 45 minutes past Estes Park, depending on the conditions. A hike around Bear Lake provides flat, easy trails, or you can continue up to Nymph, Dream or Emerald lakes. Bear Lake can be pretty crowded, even in the winter, so leave early to find parking—or stop at one of the trailheads along the way. A favorite easy snowshoeing stop is Sprague Lake. Estes Park is historically known for its saltwater taffy and wolf T-shirts, but the modern town has evolved into something much more. In fact, there's a real luxe element to explore in Estes Park that many travelers overlook. Plan a wine-tasting at the Snowy Peaks Winery. This winery is family-friendly and will even serve your kids locally made juice variations (cherry, blackberry, peach) in fancy glasses, so they can join in on the fun. After they're done, send them to the separate kids' play area, so you can sit back and enjoy another glass of your favorite from your sampling. The winery has a full calendar of live music to entertain you. Wine tastings are served on a fun, metal, glass-holding tree, and furniture is made out of recycled wine barrels. Out front, the fence is made out of recycled wine bottles. For more entertainment, there is a great selection of old-school games to play or sign up for a wine-and-paint class. Downtown Estes Park may be packed with pizza and burger places, but that's not all this town offers for foodies. First of all, the You Need Pie! cafe (yes, that's its real name) claims to have won honors for the state's best pie. It also has a build-your-own breakfast burrito option with green chili that alone is worth the drive to Estes Park. For lunch, Scratch Deli's sandwiches are robust and can fill up even the hungriest of snowshoers. The house-made pastrami is the best bet, hands down. For dinner, The View Restaurant at the Historic Crags Lodge serves the town's top food with the best view—sweeping windows overlooking the whole glowing town. The menu is expertly crafted by local chef Shad Theroux. The lodge itself opened in 1914 as the third oldest lodge in Estes, and the founder was the brother of Enos Mills, the "father" of Rocky Mountain National Park. It has deep and significant ties to the area. Plus, the food beats anything you can find on the main drag. The Stanley Hotel is the most famous lodging in Estes Park, but for something different and much closer to town, stay at a newer lodging option: Fall River Village. These high-end condos are a short walking distance to downtown and only a few miles from the entrance to the Rocky Mountain National Park. Fall River Village features two-bedroom, two-bath condos with fully equipped kitchens, living rooms (with a fireplace) and dining areas. It pays attention to the details that make a difference, like memory foam mattresses (even on the hide-a-bed couch), stainless steel appliances, a full-sized fridge, and jetted bathtubs. Request a room with the beautiful Fall River right outside your door, which you can watch from the walk-out patio or from a nearby fire pit and grill. In the winter, it's too cold to use the property's hammocks and swimming pool, but you'll love the hot tub, right next to a fire pit where you can grill up s'mores—goodies included with your stay. These spacious condos are more private than a hotel room, and the staff here go out of their way to accommodate any special requests.